Get cheap contact lenses including Focus dailies, 1 day acuvue contact lenses and extended wear lenses from Feel Good Contacts. For new customers only. Discount specifically for sunglasses. 12% discount, spend 1st Order of Coloured Contact Lenses New Customers Only. No minimum order value. Offer applies to all products. Voucher cannot be used in conjunction with any other offer or promotion. 10% discount on your first order. New customers only. Do not miss another Feel Good Contacts voucher! Simply leave your e-mail address and we'll always keep you informed of new vouchers for Feel Good Contacts. Free delivery on orders over £30 New Customers Only. £30 minimum order value. Offer applies to all products. Voucher cannot be used in conjunction with any other offer or promotion. New Customers Only. £100 minimum order value. Offer applies to all products. Voucher cannot be used in conjunction with any other offer or promotion. New customers only. 12% discount on all comfi products. Cannot be used for any other products. 10% discount on Your 1st Order of Contact Lenses, Solutions and Eye Care Products New Customers Only. No minimum order value. Offer applies to all products. Voucher cannot be used in conjunction with any other offer or promotion. £5 off your 1st order when you spend £50 New Customers Only. No minimum order value. Offer applies to all products. Voucher cannot be used in conjunction with any other offer or promotion. Latest voucher code valid at a time of promo publication was entered to be working from 2018-07-31. Contact Lenses - Buy Cheap Contact Lenses - Up to 70% Discount! Buy Contact Lenses at AC Lens. 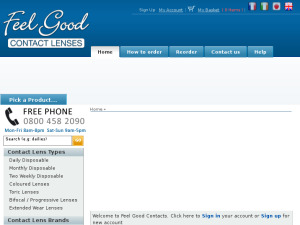 Order Contacts Online. Free Shipping.